There is an old recipe for success in politics. Be relentless. First, try the front door. If that doesn’t work, try the back. No luck. Go through the windows. If that fails, go through the roof. The Republicans failed to pass any immigration reform last week. The President caved on his family separation policy and now advocates that Congress forget about any immigration bill until after the November elections. He hopes another major story will swamp the brutal family separation images now dominating the news. However, incompetence or ignorance gives the story increased staying power. The Departments of Justice, Defense, Homeland Security and Health and Human services can’t properly identify the kids separated from their parents under the latest version of the “zero tolerance” policy—and admit there is no detailed plan in place to reunite them. The result has been hundred of arrests and thousands of minor children (as young as 1) being separated from their parents and held in more than a dozen detention facilities across the country. How does a one-year-old tell anyone his own name, let alone his mother’s? The government is prohibiting access to these facilities. So front door, back door, and windows are locked or blocked. And climbing onto the roofs is out. Even drones can’t see inside. Members of Congress, mayors, the press and lawyers are mostly refused entrance in Texas and elsewhere. 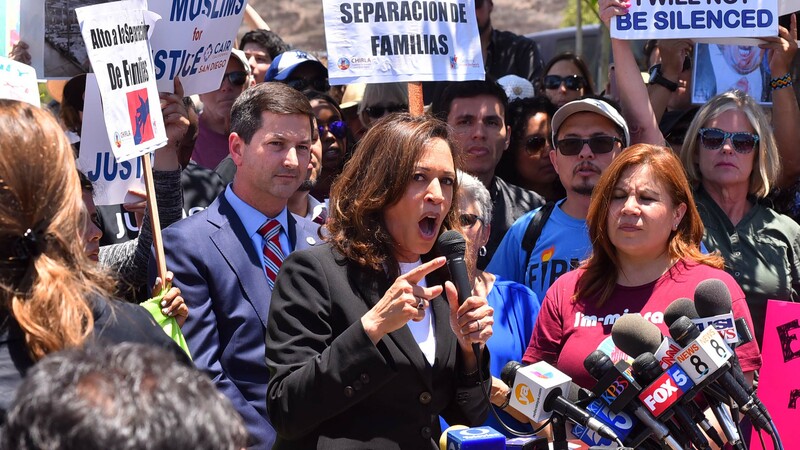 However, California Sen., Kamala Harris visited the San Diego border facility on Friday. The press was denied entrance, of course. Gov Cuomo of New York, is facing a gag order from the Health and Human Services Department—preventing him from being able to locate children or provide additional support. Over 300 of these children are sheltered in New York. So, time for all of us to “raise the roof and find the kids.” It’s time to become a hero and do what you can, where you can, when you can. The serious work must now come from those inside. Take photos. Record the voices. Tell the stories. Identify the children, if possible. Share your information and ideas. Already, heroes are abundant. And they are reinvigorating the country. These insiders have provided heart-rending audio and videotape of the “tender age” children sans parents—crying and confused—or just crawling on the ground. Maps from 14 states in which the separated children have been housed now exist—thanks to information provided by various sources—some anonymous. Airlines and their staff have refused to be complicit in the flights transporting these minors—and have been vocal about it. The popular ancestry service 23andMe is open to providing DNA matching apps to assure the children and parents are correctly identified for reunion—should that ever happen. Religious leaders (including the Catholic diocese in San Diego) have offered to provide safe housing and care for these immigrants and their families. Lawyers now stand at airports and offer free legal advice to immigrant parents who have been separated from their children and are trying to find them, while ordinary citizens hold welcoming signs and offer help. More marches, vigil, leaks, and examples of personal refusals to be complicit are forthcoming. No wonder Trump is tweeting for the Republicans to forget about immigration legislation until after the November elections. Do what you can. Where you can. When you can. Raise the roof and find the kids. Reunite them with their parents.